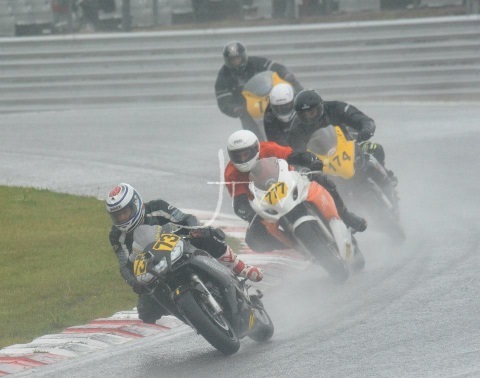 Round 7 was back in Kent at the Brands Hatch GP circuit. Saturday was dry but qualifying was disappointing. I completed 7 laps and my last was the fastest 1:47.446. This placed me in 27th. I started race 1 in 27th and finished in 29th. My fastest lap in the race was a 1:47.921. Sunday started out wet and windy. Even the caravan started leaking. We lined up on the grid for race three which I started in 27th. The race went well and I managed to stay upright for seven laps finishing in 18th with a fastest time of 2:00.888. There were 9 non finishers, all of them either crashing or suffering running problems. Unfortunately I was passed in the final corner by someone that wanted to end my race. I suffered a broken front brake lever but crossed the finish line. After that though I had no brake and ended the race in the gravel trap! Race 4 and I started in 18th and finished in 25th. My best time was 1:55.583.